Using OXO’s cold brewer is as easy as adding coffee, adding water, and walking away. The OXO is larger than competitors, but has a 32 ounce concentrated yield to match, and more importantly, the result tastes better than the competition. Cold brewers are a pretty ugly category, and OXO’s take isn’t exactly an Apple product, not to mention the amount of plastic involved. 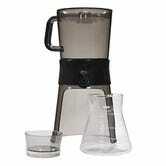 On the flip side, we love the glass beaker with airtight lid the OXO brews in to. The OXO is more expensive than some of the many analogs in the space, especially the Takeya, which is our 10th most popular product ever. But again, this is coffee, taste is everything. The “leave the coffee in the water until you pull it out” approach of the Takeya leaves a lot more margin for bitter error.